Every homeowner in California wants a beautiful landscape, regardless if he or she only has a small lawn to decorate. The need for a well-designed landscape gets even pronounced on properties with large outdoor areas. But no matter how big or small the size of your property may be, we believe that you nevertheless need to invest in beautifying it. For this reason, we at Gilgert's Landscaping offer exceptional landscape design services for clients all over the state of California. Backed by our over two decades of experience servicing clients in Turlock and other California cities, you can put your full trust on us to turn make your landscape not only stunning, but also highly livable. Improved overall style of your property or home. 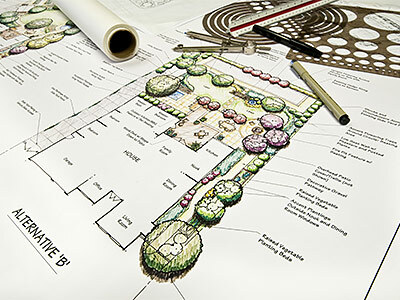 Landscape designs are meant to build on what's existing in your landscape. With an experienced landscape design firm, you can expect significant aesthetic boost in your landscape since the hardscape and softscape elements will be properly arranged and positioned, such that they are in perfect harmony. Added functionality. Great landscape designs create highly livable space, and this is where you'll appreciate hiring a good landscaping company. With proper design, your outdoor area will be more functional with properly designed and positioned elements. Reduced rework/reinstallations. Careful planning is needed to ensure that no element is out of place. For example, a gazebo that was wrongly built along a supposedly children's playground would require you to spend money to renovate the mess. This and other erroneous work can be avoided with proper design. Faster completions. With every detail of the landscape carefully drawn out and planned, you can expect timely completion of the landscaping project. This could translate to savings on labor costs and faster time for you to enjoy the benefits of your outdoor landscape. Maximized space. Proper designing would put every available space into good use. When you hire a good landscape design company, you're rest assured that your outdoor area will have only the essential amenities and elements installed, and that no space will be wasted. Why Hire Gilgert's for Your Landscape Design Needs? At Gilgert's Landscaping, you can bank on our long years of doing landscape design for numerous satisfied clients to work wonders for your own property. When you hire us, you're guaranteed to enjoy all the positive benefits that only a properly designed landscape area can bring. Our design team will ensure that all the elements — softscapes, hardscapes, waterscapes — will be in perfect harmony to make your stay worthwhile. Make the right decision today — give us a call or visit us during office hours. 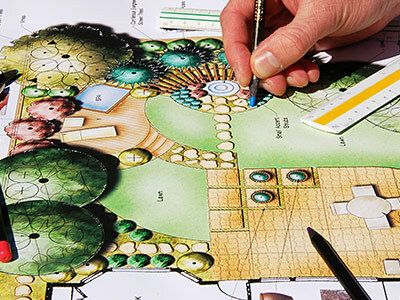 Together, we can work on a design that will bring out the best in your landscape and make it a place that you will be very proud to call your own.